KHAR: Two girls were killed and a woman was injured in house collapse incidents in Bajaur and Shangla districts as torrential rains lashed various parts of Khyber Pakhtunkhwa on Wednesday, officials said. In Khar tehsil, roof of a room in a house collapsed on the family members of one Mohammad Din in Inzari village. Local people and personnel of Bajaur Levies took part in the rescue work and recovered the body of a 10-year-old girl and an injured woman from the debris. The body and the injured woman were taken to the district headquarters hospital, Khar. According to information gathered from various sources, the rain also caused difficulties to the people of several parts of the region after roads were closed on Wednesday. They said that some of the students of far-flung areas whose master’s examinations under the University of Malakand were underway were unable to go to their exam centre in government postgraduate college, Khar, after gushing water washed away the unpaved roads. A number of students told this correspondent that they were on way to Khar to attend their examinations when the closure of roads forced them to stop their journey. In Shangla, a young girl died when a wall of her house collapsed on her due to heavy rain, which continued for the second consecutive day on Wednesday. 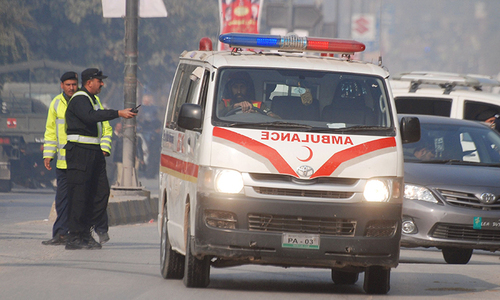 Police said that the incident took place in Machkandai area of Puran tehsil. They said that Kausar Bibi, 12, died on the spot and local people retrieved the body from the rubble. In Timergara areas, several link roads were inundated by flash floods in Talash, Maidan, Malakand Dara, Khall, Paito Dara and Rabat on Wednesday. Residents said the rain started on Tuesday night and continued till Wednesday morning, washing away several link roads in parts of Lower Dir district. 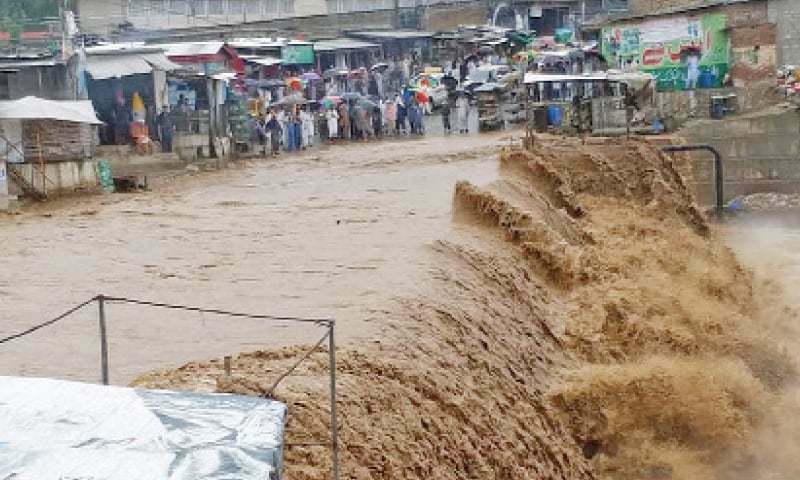 The flash floods in two streams at Talash also disrupted traffic for over three hours on Peshawar-Timergara roads and hundreds of passenger vehicles, including ambulances, waited for hours to pass the stream. In Timergara city, rainwater entered a mosque and markets causing losses to the traders. Due to improper sanitation and choked culverts the rainwater flowed on the roads in Timergara, Talash and Chakdara that caused problems for the motorists and pedestrians. In Nowshera, cloth worth millions of rupees was damaged when rainwater entered shops in Bara market late on Tuesday night. A team of Rescue 1122 helped the traders in dewatering the shops. The rainwater entered the houses and shops in low-laying areas, including Super Khattak Plaza and Qazi Plaza. Power supply to parts of the district also remained suspended during the rain.